In July, 2010, the Florida Governor’s Office designated Judy Miner to create the first "Official Florida Christmas tree Ornament". Ms Miner has also designed several of the Official Florida ornaments for the White House Christmas tree. She has been designing and creating collectible holiday ornaments for over 25 years. Her works of art in several media have received international and national acclaim. 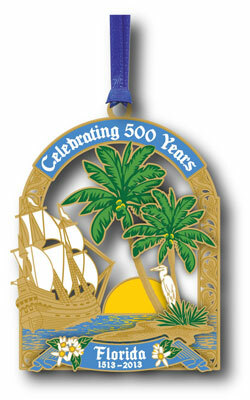 In 2013, Florida commemorates Viva 500 - marking 500 years since Spanish explorer Juan Ponce de León landed on Florida’s east coast in 1513. While Florida’s Native American heritage dates back more than 12,000 years, Spain’s claim in 1513 began a new era when the world’s cultures began to unite and transform into the nation we know today as the United States of America. Crafted in America, in 24kt gold finish, this ornament will prove a colorful and sparkling addition to your holiday tree.